In his debates with Chris Sununu, he dodges the question on Common Core. Chris Sununu has said he would remove Common Core from New Hampshire Schools. VanOstern diverts attention to his support for PACE. But most parents don’t know about PACE so is he trying to deceive them? 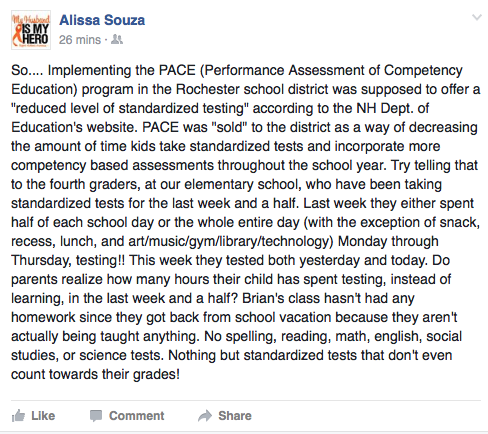 PACE is more Common Core testing in your schools. Like the other Common Core standardized tests, there’s no independent validity studies on PACE. This may be an experimental way to test your kids, but they will be testing them on Common Core. Not only will they be tested on the dumbed down Common Core standards, but also the subjective “21st Century skills.” If your child doesn’t have the right dispositions or attitudes included in the competencies, they will not advance. That’s why parents often times complain about the subjectivity in the grading. Whether it’s PACE, Competencies, SAT, Smarter Balanced, College and Career Readiness Standards, it’s all “Common Core.” Bureaucrats simply change the name to keep parents off their track. The Smarter Balanced Assessment is given 1x/year but PACE will incorporate multiple assessments. PACE was brought in to reduce testing but if you pay close attention, you’ll see testing increases with PACE. VanOstern also mentions that PACE is based on “project based learning.” That in itself has become controversial. If this is how they test, that’s how they will teach. When did you ask the State of New Hampshire to mandate teaching methods? Shouldn’t that be left up to the local district? If your child is tested on a project, how do you know they’ve mastered the content first? There is a lot of talk in the education community that facts and knowledge do not matter. Why not simply say literacy is no longer the goal in this education reform? They want to focus not on the “doing.” But public education is supposed to be about imparting knowledge so when students are ready, they can apply their knowledge. In other words, if you do not put in all of the ingredients, you cannot bake the cake properly. How do you know all of the ingredients have been put in? That’s what a lot to people are asking now. How will parents know their children have mastered their math facts or know the natural origin of the material used to make common objects, in science? This is the biggest concern parents have for this shift from mastering core content knowledge to Competency Based Education or what is used to be called, Outcome Based Education. We’ve even had a State Board of Education member in Maine write to all of our State Representatives and Senators, warning them about Competency Based Education. Every few years education reformers come up with a new and innovative way to teach children but when you peel back the layers, you find the old failed fads that have been tried before. They dress them up with a new name (Competency Based Ed instead of Outcome Based Ed), sell it like it’s new and innovative, and then hope for the best. Is this why VanOstern wants to stay away this subject? Is this why he references the PACE testing scheme so parents will not recognize it as more testing on Common Core and competencies? It sure looks to us like we are going to get the same failed standards, tests and curriculum in a VanOstern administration. He hasn’t offered parents any hope that things will get better and he dances around the subject and deceives parents in the process. If you oppose Common Core and you want something better for your kids, VanOstern is NOT the person we want as Governor. Check out where the candidates are on education here. This entry was posted in Candidates, Political and tagged chrissununu, colinvanostern, Commoncore, PACE on November 4, 2016 by SCC. New Hampshire Superintendents across New Hampshire are actively working against parents in support of HB323. HB323 has a number of problems including the implementation of the Competency Based Assessments (PACE assessments) and we encourage parents to read these critiques if they are not familiar with this legislation. Now we have Superintendents actively lobbying for passage of HB323. Why? Well many of them want to use the SAT as an alternative to the Smarter Balanced Assessment in 11th grade. Parents might be saying, but that’s not a bad option, and we agree. Why not have options for schools so they can use the best test they feel is right for their students. However parents need to also ask, what is PREVENTING the schools from offering the SATs now?? School districts could offer the SAT to their 11th grade students, they simply have to FUND IT. The State could fund the SATs in all schools too. There is no need to pass HB323 in order to offer the SATs to high school students. If you want taxpayer funded SATs then add it to your school’s budget. Do not lobby for the passage of HB323 because then schools are also tied to the PACE assessments. NO LEGISLATION IS REQUIRED TO DESIGNATE THE SAT’s AS THE STATEWIDE ASSESSMENT FOR GRADE 11 STUDENTS. No legislation was ever required to designate NECAPs or Smarter Balanced as the statewide assessments over the last ten years. No federal or state funding is at risk. 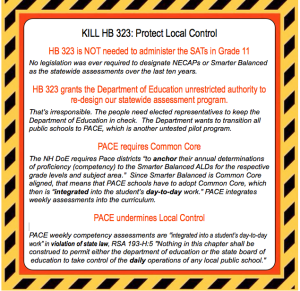 The PACE assessments come with all kinds of problems and it’s wrong to saddle the NH Senators with that baggage. Governor Hassan got New Hampshire into the Smarter Balanced Assessment MESS and shows a lack of leadership when it comes to offering schools quality standards and testing materials. 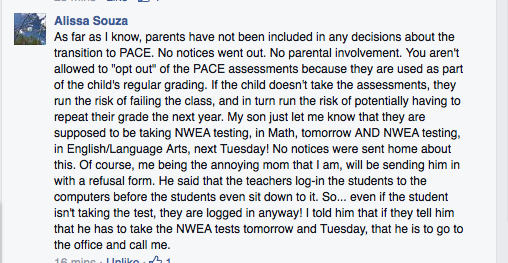 PACE is NOT an alternative parents are demanding. 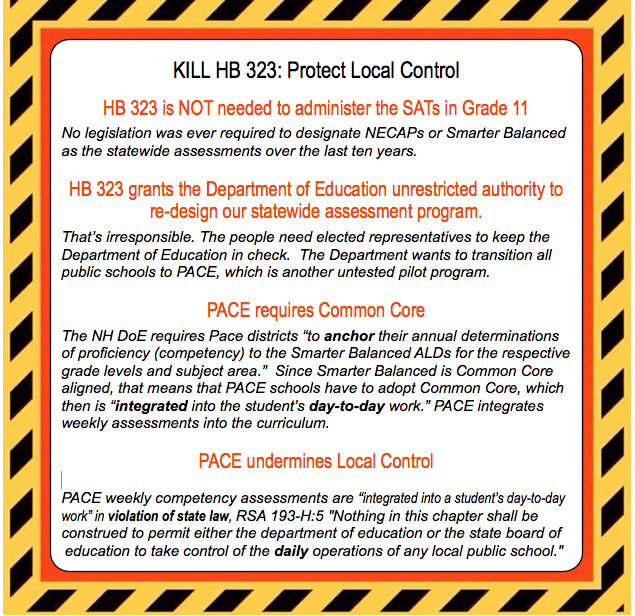 There is NO provision to OPT your children OUT of the PACE assessments and for that reason alone, the NH Senate should KILL HB323. This entry was posted in Opting Out, Testing and tagged HB323, PACE, SAT, Senators on May 13, 2015 by SCC. We’ve exposed the fraud being perpetrated on parents across New Hampshire as the NH DoE continues to sell Competency Based Ed (CBE) as “new and innovative.” Everyone should know by now that CBE is the old rehashed Outcome Based fad from the 1990‘s renamed and being forced upon New Hampshire schools. The “Competency Based Ed” fad has been called; School-to-Work, 21st Century Skills, Mastery Learning, Standards Based Ed, but we all know it’s Outcome Based Ed. CBE is based on a dumbed down workforce training model that categorizes children as human capital and teachers as facilitators. The NH Dept.of Ed is doubling down on this model by not only forcing schools to use CBE, but force them to use CBE assessments too. The new PACE assessments are performance based assessments that has the potential of becoming a real problem in some of the core classes. Let’s look at how CBE works in a math class and highlight the numerous problems we hear from math teachers and parents across NH. A math teacher would like to teach the children about multiplying fractions. The teacher prefers to use the direct instruction method of teaching because they know the students need to be taught the algorithm. The teacher begins to teach students how to multiply fractions and may then decide to engage the students to use their memory to work through the problems. That sounds like a logical approach to teaching math and yet under the CBE model, the teacher becomes the facilitator, kids work in groups and a lot of time is spent investigating and collaborating. This approach to learning math might not be the most efficient way to cover an Algebra I class. However with CBE, the teacher is now forced through the competencies to make sure their students are collaborating while learning math. 1) Parents become frustrated knowing a great deal of time is wasted in group learning. 2) The student who may know math relatively well is often times the one who teaches the other kids in the group. This leaves some parents to question why their child is not receiving the teacher’s salary. 3) Kids often times report a lot of socializing is going on and not much learning. 4) After numerous group activities, parents begin to realize the learning process has been severely slowed down causing their children to begin falling behind their peers in schools that use a more logical approach to teaching. 5) Students often times admit they’re not learning much but hey, the teacher did manage to meet a competency by getting the students to collaborate. In other words, there isn’t a lot of learning going on under this method because the reformers believe that the “collaboration” workforce skill is more important than learning the academic content. This is what happens in some of classes that use the CBE model. How do we know this? We’ve been through this for the past 20 years with no real data to prove this model improves academic achievement. The NH DoE has certainly provided no independent data that CBE will improve academic achievement. That’s one of many examples of how the Obama/Hassan administration is redesigning public education in NH. Not only are they forcing the dumbed down Common Core curriculum on our schools through the Common Core Assessment, they have also forced CBE on our schools too. This is all part of the Obama redesign in public education and being facilitated through the Hassan DoE. NH Families for Education has been a vocal opposition to this entire redesign and has pushed back in an effort to support parents and teachers in NH. They are one of a few organizations that have been in this battle to stop the top-down approach to education and has been supportive of local communities driving the education in their own public schools. Today NH Families for Education posted an article that included a letter from the U.S. Dept. of Education to NH Commissioner of Ed, Virginia Barry. In the letter it spells out how the Commissioner again, is working to fully implement CBE in our schools. This falls in line with the U.S. Dept. of Ed’s agenda to redesign public education in NH. You are reminded that the parents, teachers and legislators in NH never asked for this. You are reminded that this agenda comes from the FEDS. You are reminded that our own NH DoE is almost fully funded by the Federal Govt. You are reminded that the NH DoE is facilitating the Obama agenda, NOT the New Hampshire agenda. We strongly encourage you to read the article and information provided by NH Families for Education. We also strongly encourage you to read our prior posts on the PACE assessment program being pushed on our local schools. The parents who refused to let their children take the Smarter Balanced Assessment are at a real risk if HB323 goes through as it’s been presented. There is NO provision to opt your children out of these experimental assessments based on the Outcome Based Education Model. Knowing the OBE model is all about social engineering and not academics, we can only imagine how bad these assessments will be. It’s critical that parents have the right to OPT out of those psychometric assessments if parents find the problems in the PACE assessments that they are seeing in the Smarter Balanced Assessments. It’s unfortunate that the NH DoE lost the trust of many in New Hampshire by signing on to the SBAC with no input from the legislators, parents or teachers in NH. It is up to the local communities to decide what standards, curriculum and tests should be used for their students. The NH DoE has proven they are ill-equipped to make these important decisions for our children. We trust the local communities to begin the process of setting standards, choosing quality curriculum and testing students in a way they see fit. This entry was posted in Legislation, Opting Out, Testing and tagged CBE, HB323, PACE on April 27, 2015 by SCC. WHY IS the Smarter Balanced Assessment (computer adaptive) DANGEROUS? 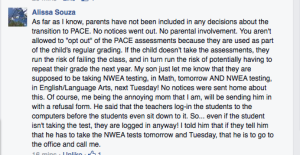 Why are the new PACE Assessments DANGEROUS? Why is Competency Based Ed (aka…Outcome Based Ed) DANGEROUS? Why is the State of NH under Governor Hassan now fully implementing all of this in NH directly from the Obama Agenda? Peg Luksik in this SHORT video explains why. One of the BEST/short videos you will want to watch. This entry was posted in Miscellaneous and tagged Commoncore, CompetencyBasedEd, PACE, PegLuksik on March 19, 2015 by SCC.